This is a full course on how to perform for children. It not only includes a lot of suitable tricks, but also all the other important factors you need to consider when performing for children. 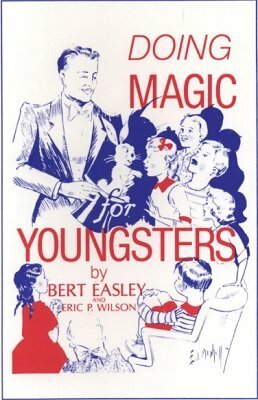 Even if you've been doing magic for juniors all of your life, there are valuable instructions, pointers, rules, hints and vital information in this work that are worth much more to anyone who entertains the small-fry. RULES - BREAK THEM AT YOUR OWN RISK! No. 1. "The Wand and Silk." No. 2. "The Bottle and Glass." No. 6. "At THE PARTY." No. 8. "The Magical Barber." No. 9. "Black and White." Chapter V. HINTS ON HOW TO MAKE THE TRICKS. No. 1. - "The Wand and Silk." No. 2. - "The Bottle and Glass." No. 4. - "Paper Bags." No. 5. - "Brer Rabbit." No. 6. - "At the Party." No. 8. - "Magical Barber." No. 9 - "Black and White." No. 11. - "Christmas Eve." Chapter VI. FOR YOUR NUMBER 2 PROGRAMME. "The Man in the Moon." 1st edition 1972, 83 pages.